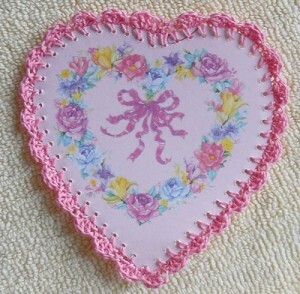 By adding a nice crochet edge you can make a Valentine's Day card more personal and special. This is a guide about making a crocheted edge Valentine card. Notes: Read instructions all the way through before beginning. Depending upon how far apart your holes turn out, you may need to ch 2 between the sc. With a pencil lightly draw a heart, circle, or oval around the picture on the card. Cut out the shape, cutting just inside the pencil marks. On the back side draw a line about 1/8 inch from the edge. Then punch holes every quarter inch using the line as your guide. Round 1: Attach thread with a sc in one the hole just to the left of the dip. *Ch 1, sc in next hole. Repeat from * around, except work 3 sc in hole at tip of heart. Join in the first sc with a slipstitch. This is a very beautiful Valentine's Day Card. Wish I'd seen it sooner, but maybe I can whip up something tomorrow by dinner time. It's really a nice idea. This is great.Thanks for sharing the idea. Very pretty! I'm going to try it. You are so creative. I love this! 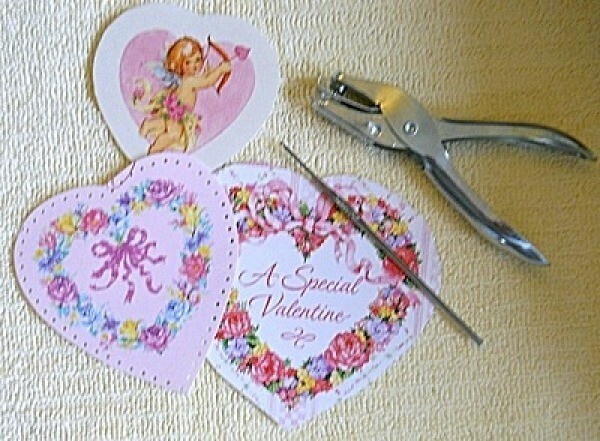 I think I'm going to make some for the kids & grandkids for next Valentine's Day.